Primary schools from across the local area travelled to the Royal International Air Tattoo on Friday (July 13) to compete in the Junior Engineering Challenge final. The STEMworks (Science, Technology, Engineering, Maths) initiative funded by the RAF Charitable Trust, saw 16 local schools compete to win a cash prize and trophy. In teams of two, the children were tasked with building and racing their own car, building with Meccano construction sets and designing something to help the RAF in the future. After a tough decision from the judges -including Apollo 15 astronaut Al Worden and STEM representative Mo Follis - three schools came away victorious. 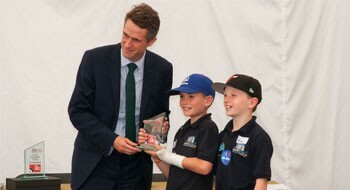 Fairford C of E Primary School, Ashton C of E Primary School, and Cirencester Primary School all took home awards presented by Gavin Williamson, the Secretary of State for Defence. Al Worden, who watched as the children competed in the final race said: "This is an awfully important thing for me. I encourage all children to study maths and engineering - I think it's fabulous." The final took place in the Air Tattoo's TechnoZone where STEM subjects are brought to life through cutting edge exhibits and interactive activities, designed to engage and inspire future generations.